The beekeeping equipment we use - mainly the hive type. The beekeeping methods we use - how we interact with the bees and the hive. The intention of this post is to tease apart some of the (sometimes thorny) issues related to selecting a hive. This is especially relevant to beginning beekeepers. Once you select a hive type, you are likely to undergo training and invest in equipment. This can lead to a financial and perhaps psychological 'lock-in' to that system. This may be OK if you are happy with your initial choice, but not if you later decide you should have gone in a different direction. Perhaps we should aim to make informed decisions with good information, rather than with wisdom received from someone already locked into a system? In this post, we will cover the first topic and the others will be written under their own post. 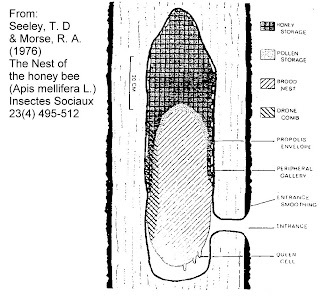 The most relevant dimension of a hive is its internal size, primarily its volume (we use litres) because that is the overall space a colony has to work with. For conventional beekeeping this is possibly the only consideration. The larger the volume, the more space for bees/comb/honey storage. From an NB perspective we are very concerned with hive temperature and heat retention within the hive. The inside of a hive needs to be warmed to (and then maintained at) a suitable temperature, around 35 degrees C for the brood area. This requires the bees to generate that heat using nectar/honey to vibrate their wing muscles. The larger the volume, the more stress the bees are under in order to maintain the required temperature. There is another factor here and that is how the hive is configured - if there is lots of empty space above the brood area, stress is increased dramatically. If, as Natural Beekeepers, we wish to replicate the bees' natural environment as closely as possible. If so, then we are looking for something that mimics the internal hollow of a tree (usually a vertical tree, but it could be a horizontal/fallen tree or log - see diagram below). This would be a hive forming an internal cylindrical shape and this requires a box which is square, rather than rectangular, when viewed from above. This shape fits the tendancy that bees have to work within a spherical shape when rearing brood or clustering for winter. 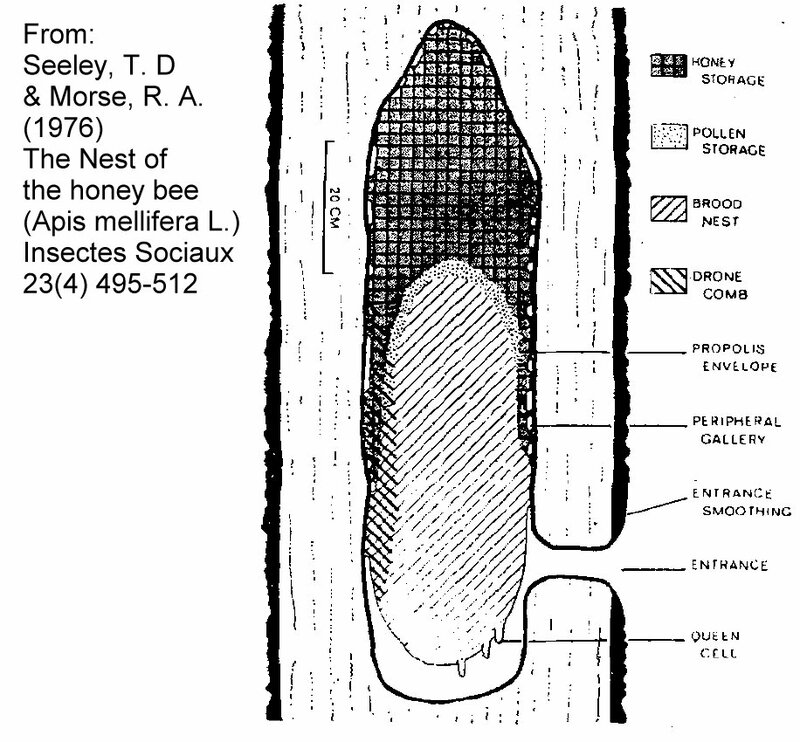 The size (area) of that square shape is also important because as the brood area moves down a hive box, the bees have to heat a greater volume (of air and comb). If the area is large, they have a greater volume to heat, per cm of depth. The dimensions (the cm measure of the square sides) is important because it should closely match the natural clustering of the bees. There are a number of reasons for this. For example, in winter, bees cluster together for warmth and eat their way upwards into their honey stores. In a square box (of appropriate size) they fill the square and this minimises heat losses. It also ensures that all honey is accessible to them from below. In a rectangular shaped box, in winter, there is unused/cold space to each side of the cluster, the honey there is not readily accessible and there is also the potential for condensation to form on the hive walls. Please note though that for the framed hives, these are the GROSS volumes. Actual usable (i.e. can build comb or otherwise reside in) volumes are lower because the wood of the frames takes up a percentage (9.1% for the Lang and 7.7% for the Warre) of the space inside the hive. This is very important because it means the bees are warming up space which is unusable to them. The amount of space within that volume available to build comb - it's an insulator. Whether the comb can be formed into 'gallaries' which are sealed - they trap heat. We'll cover these in more depth later posts. Warre - a square section box, with a small volume. Vertical stacking. Higher frame volume efficiency. Kenyan - a trapezoidal shaped box, large volume, which can be finely managed with 'follower boards'). Horizontal direction. Langstroth - a rectangular shaped box with large volume. Lower frame volume efficiency. The Warre - a hollow tree trunk? Inside the Kenayn - a fallen log? Langstroth's box - a natural shape for bees?